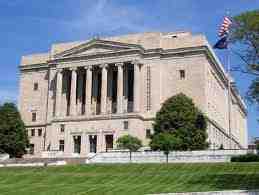 The Dayton Masonic Center, formerly known as the Dayton Masonic Temple, is a significant building in Dayton, Ohio. It was built by a Masonic Temple Association formed from 14 Masonic groups. The building was completed over a 2 year, 9 month period and completed in 1928 by 450 workers, "a majority of whom were Masonic Brethren." It was said: "Without thought of honor or gain, these men gave unstintingly of their time, abilities and means, sparing neither themselves nor their personal interests to advance this building project to its happy fulfillment." The building is 265 feet long by 190 feet wide by 80 feet high, and encloses 5,000,000 cubic feet. It is constructed of steel, cement, and stone, including 55,000 cubic feet of Bedford stone and 15,000 cubic feet of hard limestone and marble from Vermont, Alabama and Tennessee. The marble was used for interior floors, wainscotings, partitions and stairways. 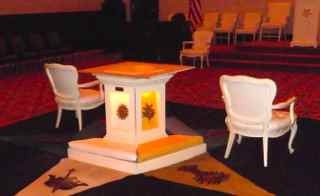 ”Perhaps you would like a tour inside the beautiful Dayton Masonic Center overlooking downtown.” This is a message from the Dayton Lodge 147. Going inside is pretty simple. Frequently many events are located there or you can actually walk in and talk to the receptionist. The best thing to do is find a Mason who will give you a tour. There are many, many, rooms in this building (allegedly 250) and each that I have seen is unique. 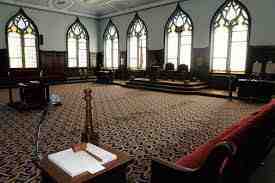 Depending upon a person’s Masonic membership, he or she went to the meeting in a specific room. As you can see, all of these are totally different! 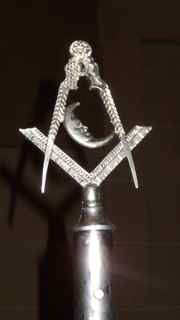 When I was on an official tour with a Mason he was very cordial and helpful. He had no problem with me taking photos or asking him questions all about the Masons and the building. The Scottish Rite Auditorium seats approximately 1800 people and it has been totally redone. It is large and depending upon the event there may be seats on the floor as well. This is where many performances are held for live entertainment and they also have a motion picture screen. This building is indeed huge. 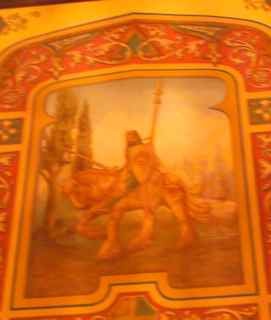 In the building are seven pipe organs and the largest one is in The Scottish Rite Auditorium and it has 4,375 pipes. They also have a library with 3,500 volumes with many pertaining to Masonry. The Masons are doing so much to preserve it and to keep this facility vital. Please note: The Dayton CVB has compensated me to share my thoughts on the Dayton Masonic Center.